We're doing great things here at Holy Cross Catholic School! We've earned a reputation for our academic excellence, nurturing staff, and commitment to spiritual enrichment. We provide a wide range of resources that empower our students to recognize and develop their God-given gifts and abilities. We first opened our doors in 1949 and have provided a safe, supportive, learning community ever since. 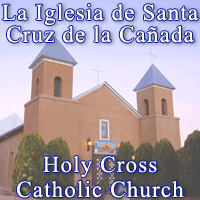 HCCS is a member of the Archdiocese of Santa Fe. It is accredited by Western Catholic Educational Association (WCEA). Our beautiful campus includes the Historic Santa Cruz De La Canada Church, three elementary buildings, our cafeteria (Marian Hall), the gymnasium, and two separate playgrounds. HCCS is home to approximately 70 students in pre-kindergarten through sixth grade. Most of our children have attended our campus since pre-kindergarten. Many of our students have siblings enrolled at the same campus and have parents who also attended HCCS. Holy Cross reaches out throughout Rio Arriba and Santa Fe Counties, welcoming students from seven “feeder” parishes. We weave elements of faith into the learning process by making religion an integral part of the daily curriculum. The school day begins with an all school Morning Prayer at which families are welcome. Our day ends with prayer. We encourage our students to incorporate their knowledge of faith into their everyday lives. We create tangible reminders of their faith in classrooms and throughout the school in the form of bulletin boards, pictures, statues, and prayer centers. We integrate fundamental principles of faith in all subjects, especially through writing, reading, art, and music. We encourage and inspire our students to recognize and respond to the needs of others by sharing their gifts, talents, and time. We provide frequent opportunities to serve the school and the community. With their involvement in these activities comes a sense of personal worth and appreciation. We believe that spiritual and social goals are just as important as academic and intellectual goals. A student led team H.O.P.E (Helping Others Providing Education), under the direction and guidance of staff, plan and coordinate these activities. What makes HOLY CROSS CATHOLIC SCHOOL UNIQUE? We proclaim that God comes first. We proclaim the dignity and value of every human person. We teach the importance of Sunday Mass and daily prayer. We value parents, families, and teachers. We respect and treat others the way we want to be respected and treated. We are honest and tell the truth. We respect the material world that God has given us. We do our best and are honest and truthful and take responsibility for our actions. We value self-discipline and self-control.